Was it an unreasonable request? I’m standing in line at Dulles airport, waiting to get some lunch. I’m on my way to the DMEC Annual Conference in Austin, TX. I can’t wait to see my peeps, yet bummed that I can’t clone myself and see all of the sessions. I mean, let’s face it, there’s a lot of information to be had in this industry! Then the woman in front of me places her order and says “I’d like a chicken salad sandwich, but I’m vegetarian, so no chicken, please.” Um, say wha? After giving her the one eyebrow up look, I thought about it. She has a request, perhaps a need, and she didn’t let the standard menu of options get in her way. How about your requests or needs, how often to you let the standard menu limit you? When was the last time you consciously decided to drive your organization based on its needs, rather than by using the same flow of process and information you inherited from the last person? How do you stay informed when there is so much information and you can’t clone yourself? Don’t get me wrong, I get it – sometimes you feel like you’re on the deck of the Titanic and the band is playing! Some of you will say “Carla, now is not the time to wonder if I could ask for a vegan option at breakfast tomorrow, as I’m spending every last second looking for floating debris until a life boat shows up!” Get ahold of yourself! Be your own lifeboat! While we’re here (at the DMEC, that is), let’s take advantage of all the incredible hard work by the DMEC peeps (not so subtle shout-out to my former peeps), the exhibitors, and the attendees who are currently letting their piles at home triple. Take a look at the different topics for primary and break-out sessions. These are ‘The Hot Topics’, or they wouldn’t have made the cut. When you’re not even sure where to start, these can give you guidance on where to put your limited resources. You don’t have unlimited funds, so don’t waste them. Prioritize with a little help from your friends. Are you a member of different forums? Do you utilize the resources made available by organizations like the DMEC, SHRM, and other LinkedIn groups? 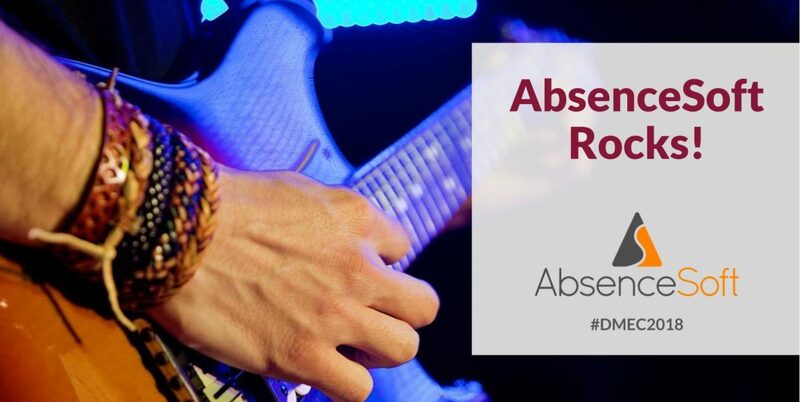 Do you follow informative and witty blogs (ahem, like those published by AbsenceSoft)? Although some forums may have a fee associated – many are very reasonable and your company will benefit from the membership. You don’t have to do this alone. A few years ago, the DMEC kicked off a group of hospital administrators from different hospitals around the country. The point was so they could share their unique issues, but more importantly, their solutions. Why shouldn’t they? Only another hospital will get it. Currently there are carriers who openly hold absence conversations that are topic specific and they invite (insert scary music here) their competitors! Who better to talk it out, then others who know your pain? They can help find solutions, and your spouse can stop staring at you with a look of “Yes, go on” while they are really thinking “Huh?” at dinner every night. Unless, of course, you and your spouse are in the same industry, but really, how likely is that? I challenge you to take just 10 minutes to come up for air and order without the menu in front of you. You may be pleasantly surprised at the solutions that may be available and before you know it, others will be saying “I’ll have what she’s having.” Of course, I still have no clue what must have been in that ‘chicken salad sandwich without chicken’.